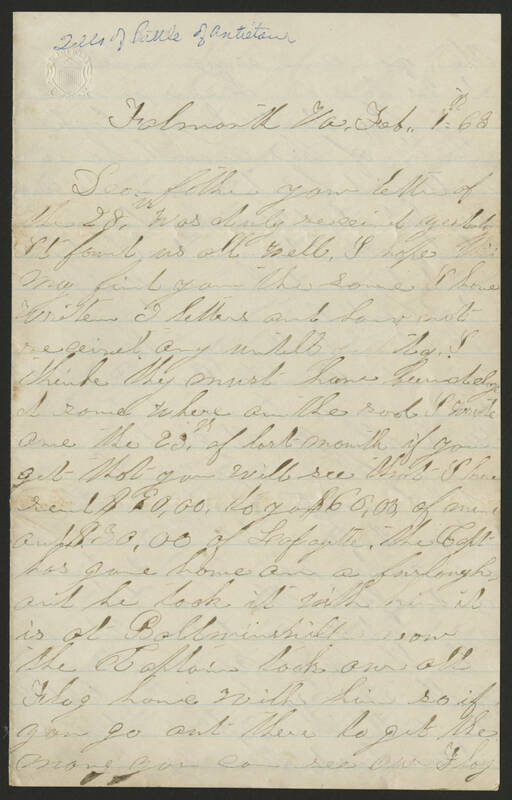 "Tells of Battle of Antietam" [in blue pen] Falmouth Va, Feb. 1st 63 Dear father your letter of the 28th was duly received yestday. It found us all well. I hope this may find you the same. I have written 2 letters and have not received any untill yestday. I think they must have been delayed some where on the road. I wrote one the 23rd of last month if you get that you will see that I have sent $90.00 to you $60.00 of mine and $30.00 of Lafayette. The Capt has gone home on a furlough and he took it with him it is at Baldwinsville now. The Captain took our old Flag home with him so if you go out there to get the money you can see our Flag.